Three occasions to celebrate in New York Cityt he First Contemporary Performance of Lorenzo Da Ponte’s "The Musical Bee". "L’Ape Musicale" will be staged at Columbia in its first modern rendering on October 15 and 17 at 7:30 pm in Low Memorial Library, the most prestigious building on campus. The opera will be performed by the Orchestra and Chorus of the Teatro Lirico di Cagliari under the conduction of Donato Renzetti; it will be directed by Davide Garattini Raimondi. On Tuesday, October 16, the same ensembles, conducted by Renzetti, will be at the Basilica of St. Patrick’s Old Cathedral in Little Italy, Da Ponte’s own parish (where his funeral was held 180 years ago), for a concert recalling the charity event held there on June 22, 1826, an “Oratorio for the Benefit of the Orphan Asylum” that starred Manuel García and his daughter Maria Malibran. 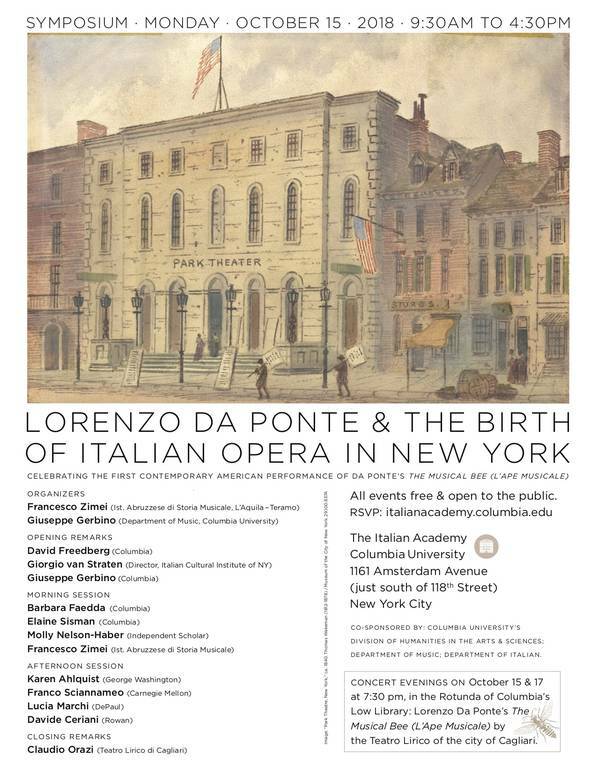 A one-day symposium will cover a wide range of research on the early days of European opera in the U.S.Lorenzo Da Ponte and the Birth of Italian Opera in New York at The Italian Academy, Columbia University (1161 Amsterdam Avenue • New York, NY 10027). 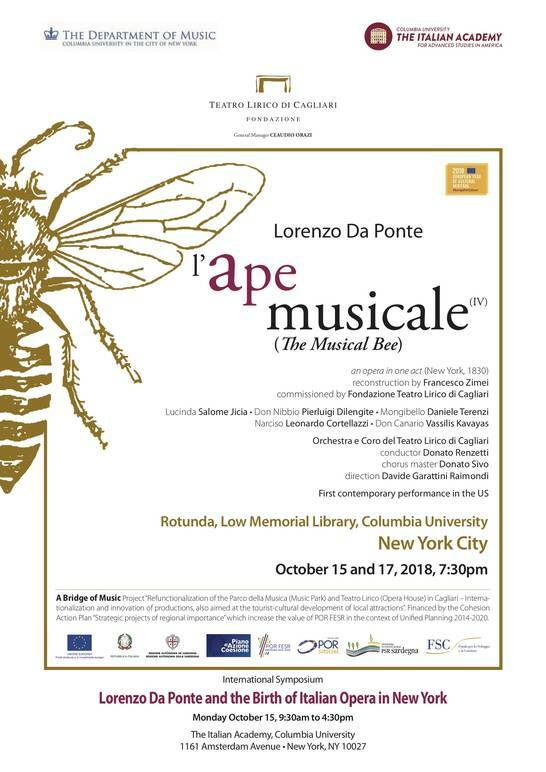 L’Ape Musicale (The Musical Bee), Lorenzo Da Ponte’s final libretto and the first Italian opera conceived and staged in the United States, returns to New York 188 years after its debut – thanks to the invitation extended by Columbia University to Claudio Orazi, superintendent of the Fondazione Teatro Lirico di Cagliari. After their success with the Campana sommersa by Ottorino Respighi, performed last year at Lincoln Center in cooperation with New York City Opera, they once again honor the cultural relationship between Italy and the United States – this time with a focus on Lorenzo Da Ponte. The famous Venetian man of letters, author of Mozart’s most important librettos (Le nozze di Figaro, Don Giovanni, Così fan tutte), became a remarkable example of Italian intellectual migration to America – he was the first Professor of Italian at Columbia and, indeed, at any American university – and he pioneered the production of Italian operas in the U.S. His pastiche called L’Ape Musicale was performed at the Park Theatre in New York on April 20, 1830. L’Ape Musicale will be staged at Columbia in its first modern rendering on October 15 and 17 at 7:30 pm in Low Memorial Library, the most prestigious building on campus. The opera will be performed by the Orchestra and Chorus of the Teatro Lirico di Cagliari under the conduction of Donato Renzetti; it will be directed by Davide Garattini Raimondi. The production (part of the Internationalization Project of the Teatro Lirico di Cagliari promoted by the Region of Sardinia and included in the program of the European Year of Cultural Heritage, supported by the Ministry of Cultural Heritage and Activities) will also be the subject of an international symposium on October 15 titled “Lorenzo Da Ponte and the Birth of Italian Opera in New York.” Organized by Columbia’s Department of Music and its Italian Academy for Advanced Studies, it will be held at the Italian Academy, which this year already presented the exhibition “From Da Ponte to the Casa Italiana: A Brief History of Italian Studies at Columbia University,” curated by Barbara Faedda, Associate Director of the Italian Academy and author of the book bearing the same title. On Tuesday, October 16, the same ensembles, conducted by Renzetti, will be at the Basilica of St. Patrick’s Old Cathedral in Little Italy, Da Ponte’s own parish (where his funeral was held 180 years ago), for a concert recalling the charity event held there on June 22, 1826, an “Oratorio for the Benefit of the Orphan Asylum” that starred Manuel García and his daughter Maria Malibran. 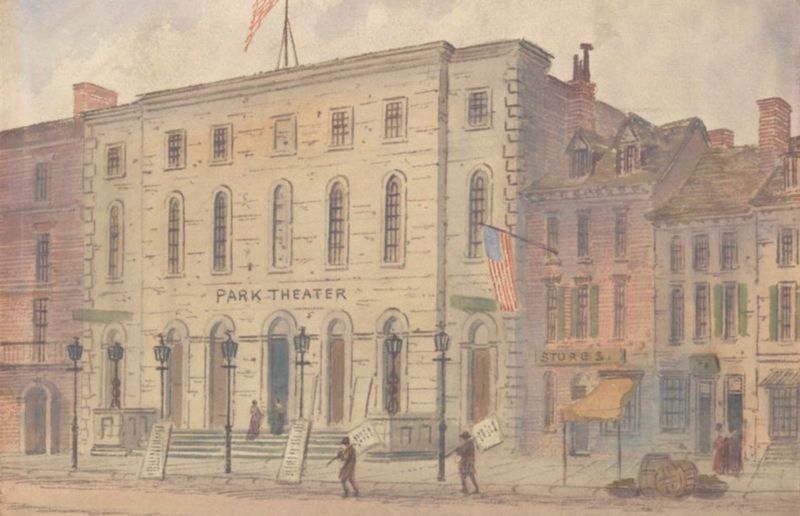 With them was the company of artists who, under the auspices of the great Venetian librettist, led the first season of Italian opera at the Park Theatre. The invitation for this October 16 concert was extended directly by the chapter of the first Catholic cathedral in New York, one of the most ancient and prestigious institutions in Manhattan celebrating the relationship between culture and spirituality.